*Offer valid for University professors in the United States and Canada, from July 2018 to June 2019. Fees may apply for further customization, technical support or attendant services. 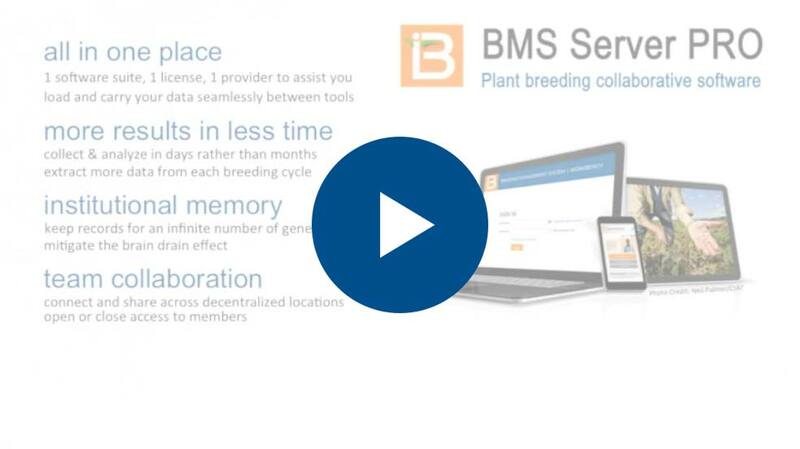 The BMS makes my job easier in developing multi-location trials based on the availability of seed. Together with my team, and with the right technology in hand, we are effectively enhancing the rate of genetic gain of our mandate crops says Dr Hingane Anupama, pigeonpea breeder at ICRISAT. Dr Elliot Tembo is a Senior Maize Breeder and the Head of Station/Group Breeding Systems Manager for Seed Co in Ghana. In his own words: "I was convinced that the BMS would answer our needs and have been spearheading its use across all of our breeding activities ever since." Kofi Bimpong is a Molecular Biologist and Breeder at AfricaRice. He works on rice for higher yield and other important traits, and strongly believes that: "efficient data management systems and molecular approaches can accelerate our achievement of breeding goals." Support: training material, help desk and peer communities. Crop databases, query tools, and standardised trait dictionaries for nine crops. Licences for Breeding View (BV) embedded in the BMS v3.0.9 will expire for some on 31st December, and for others on 30th January. Please contact VSNi at support@vsni.co.uk. With now more than several hundreds of users around the world, we are at a key milestone for BMS deployment. We therefore need your cooperation to complement the information about you and have a better understanding of your needs for the tool and support services. Upon renewal, our team will contact you to expose you to our revised software policy and evaluate your needs for continued use of the tool with a longer term licence. This important step will help us provide you timely information and more responsive services in the future.